You are just minutes away from downloading FunkyChops. We would like to offer you QuickBeat today for a special price. 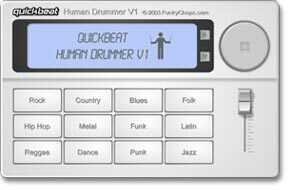 QuickBeat allows you to play with a drummer, which is one of the fastest ways to be a better player. Easy software download for Windows & Mac. Jam with QuickBeat and play better!